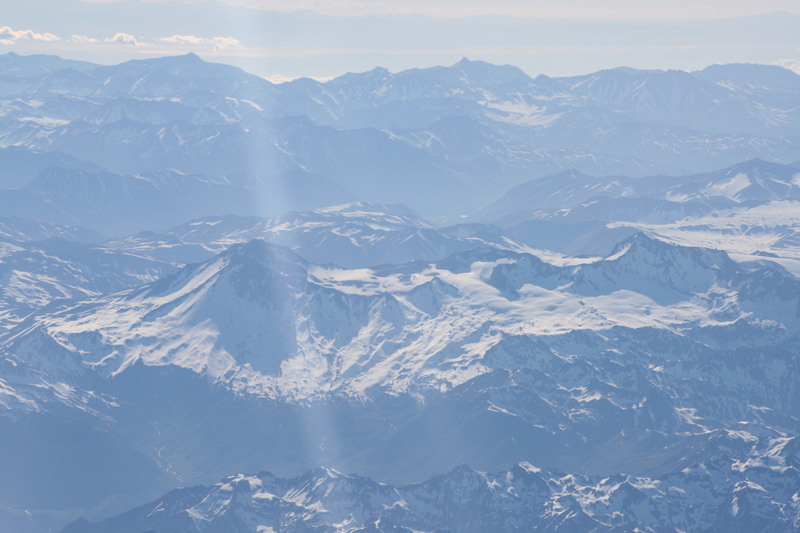 If you are ever in Chile and have the chance to take a mid-morning flight south from Santiago towards Puerto Montt or Concepcion, make sure you try and book a window seat on the left hand side of the plane. 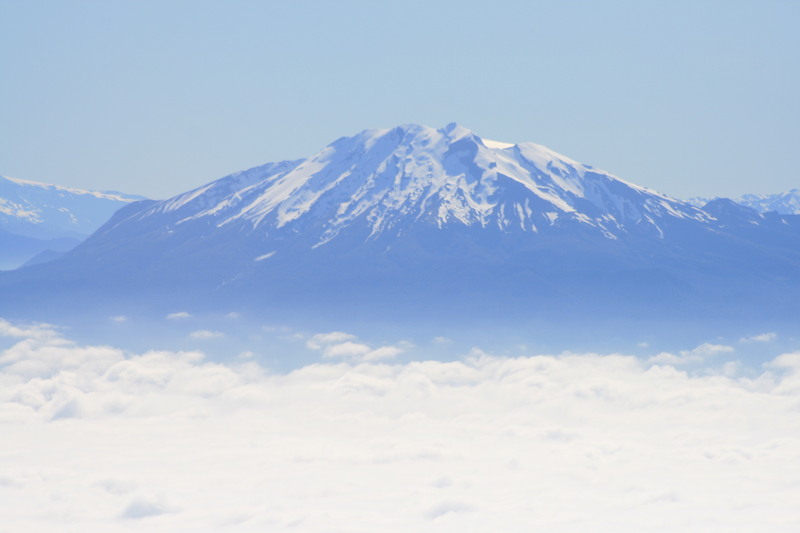 Once the early morning cloud has cleared, you could be in for a treat as you fly along the ‘volcanic front’, with spectacular views of Chile’s brooding volcanoes popping up from the landscape. Be sure to take a map, too, so that you can work out which one is which. The pictures below are roughly in order, flying from north to south – and several major volcanoes of the chain aren’t included. 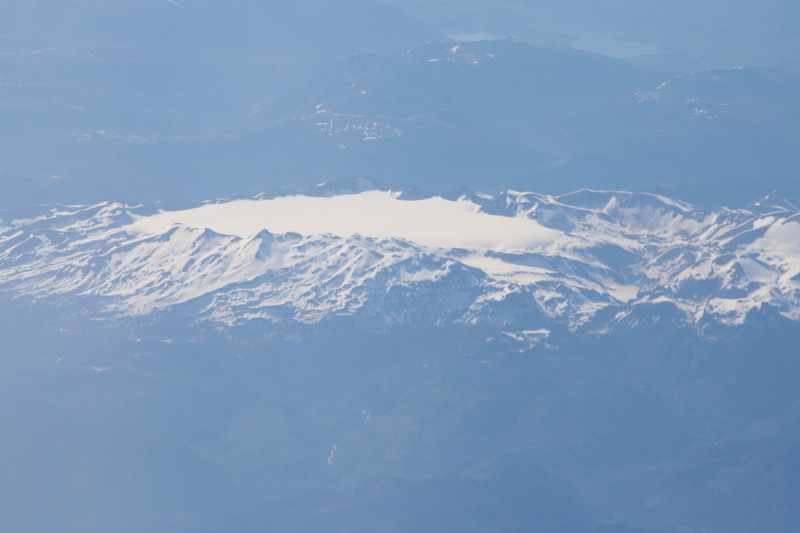 There are several things to notice about these volcanoes – they are often in pairs, either as distinct but closely spaced mountains (Tolhauca and Lonquimay), or as ‘twin peaks’ forming the summit of an elongated massif (e.g. Llaima, Mocho Choshuenco). 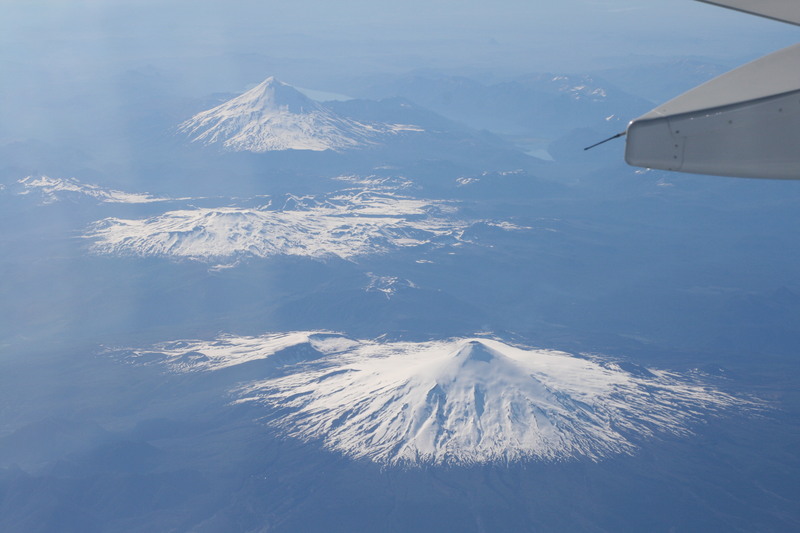 Many of the volcanoes are also clearly very young structures – forming wonderfully characteristic conical shapes (e.g. 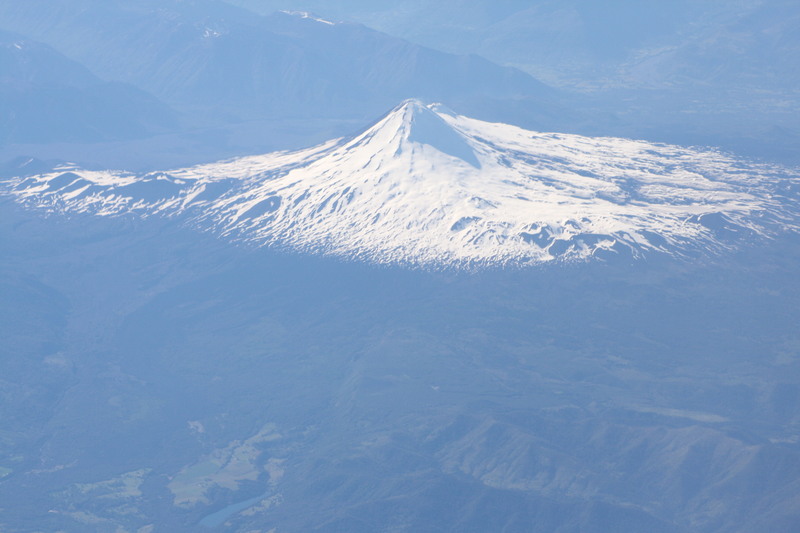 Antuco, Villarrica, Osorno). These cones must be younger than 15 – 20,000 years (and perhaps much younger than this), based on what we know about when the last major glaciation in the region ended. 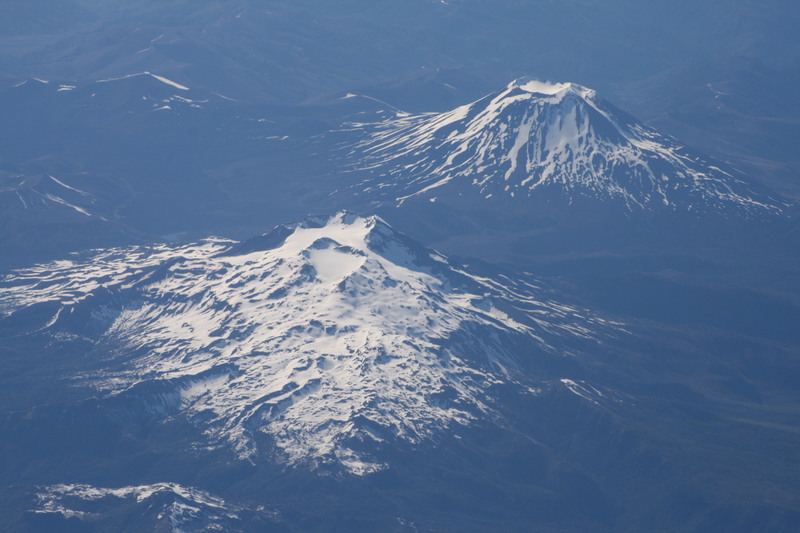 These cones sit on top of the lower-relief and older parts of the volcanoes, many of which have been reshaped by caldera-collapse, perhaps shortly after the ice retreated during deglaciation. The accessibility of the volcanoes of the Southern Volcanic Zone of the Andes makes this a wonderful place to study volcanic processes and volcano behaviour, both at the scale of individual eruptions, as well on the regional scale. The saddle-shaped volcanic complex of Planchon-Peteroa (35.2 S), which last erupted in 2011. The spectacular ice-filled summit crater of Descabezado Grande volcano, Chile, at 35.6 S. The last eruption from this complex was in 1932, shortly after an eruption of the nearby volcano Cerro Azul (or Quizapu). View across the volcanoes of Tolhuaca (or Tolguaca, near ground) and Lonquimay (38.3 S). Both volcanoes are young, but it is not known when Tolhuaca last erupted. Lonquimay last erupted from 1988-1990. 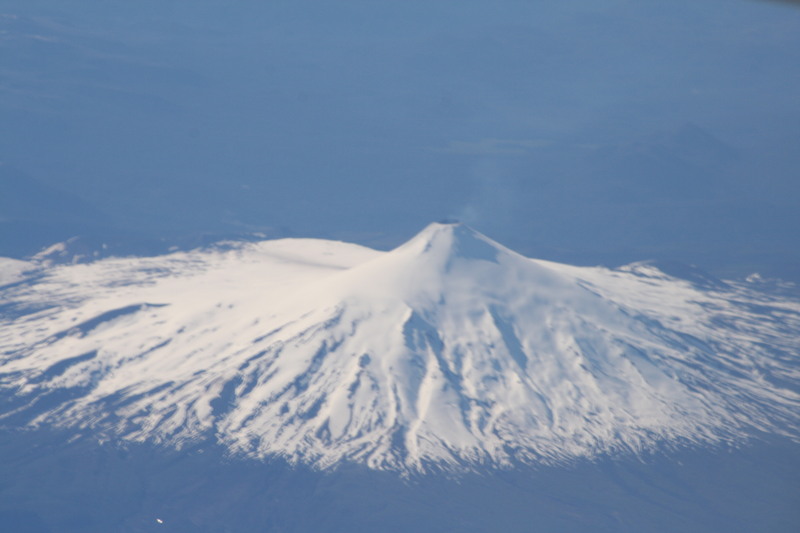 The young cone of Volcan Antuco, 37.4 S. Its last known eruption was in 1869. 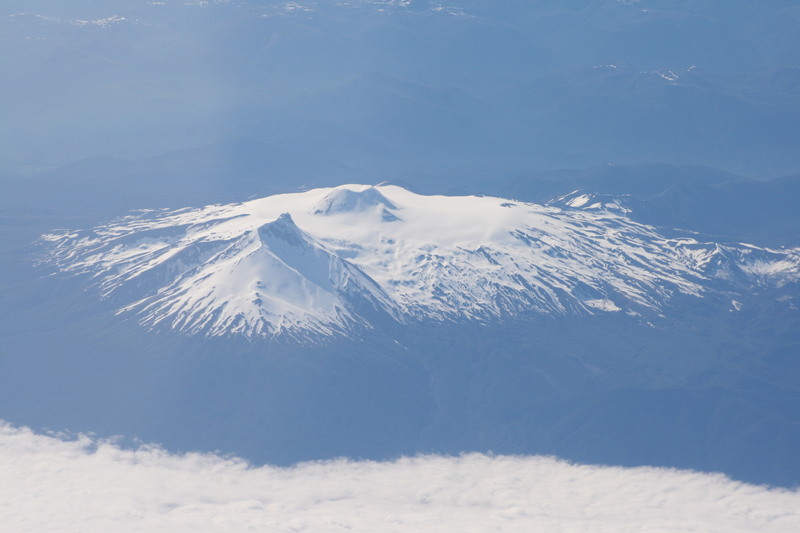 Twin-peaked Llaima (38.7 S) is one of the most active volcanoes of southern Chile, and last erupted in 2009. 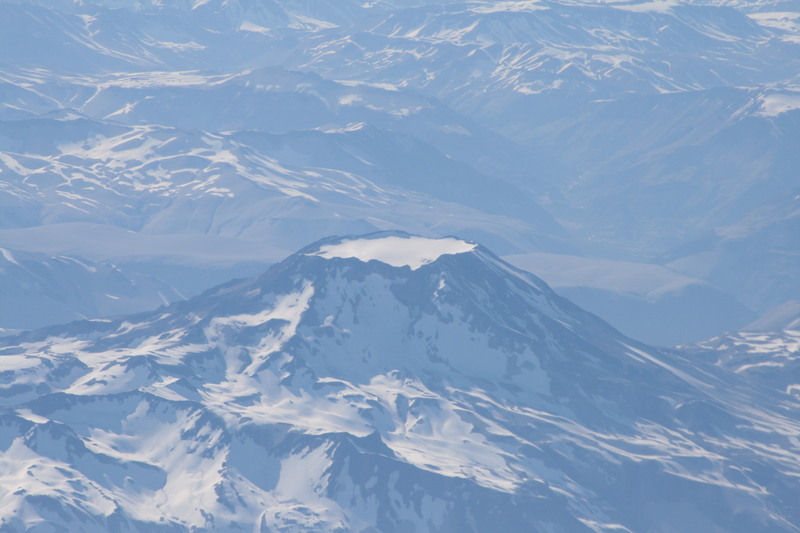 Panorama across three young volcanoes, looking east: Villarrica (39.4 S) in front; the snow-covered sprawl of Quetrupillan in the middle ground; and the peak of volcan Lanin, on the Chile – Argentina border, in the distance. Villarrica, with a characteristic thin gas and aerosol plume rising from the open crater at the summit. The twin-peaked volcanoes Mocho Choshuenco (39.7 S). Choshuenco, thought to be the older vent, is the angular crag nearer the camera; Mocho is the small cone in the middle of the summit plateau. Mocho last erupted in 1937. 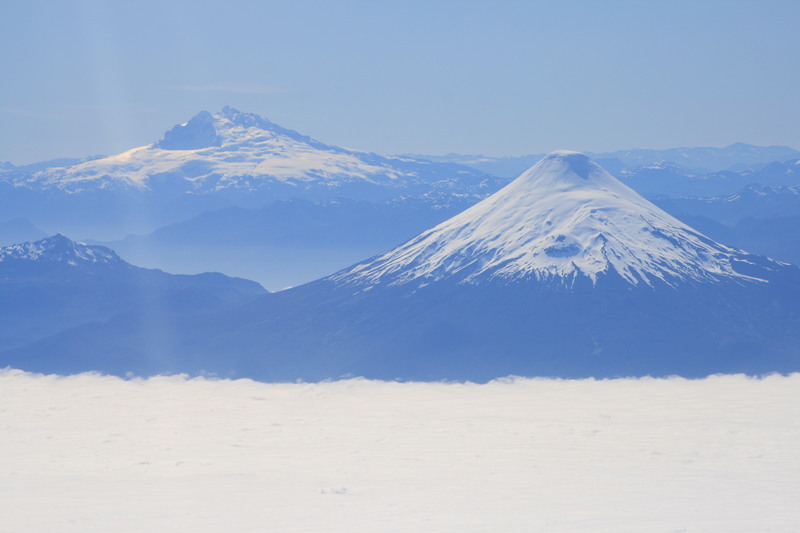 Looking across a bank of cloud towards volcan Osorno (front, 41.1 S), and volcan Tromen, in the background. 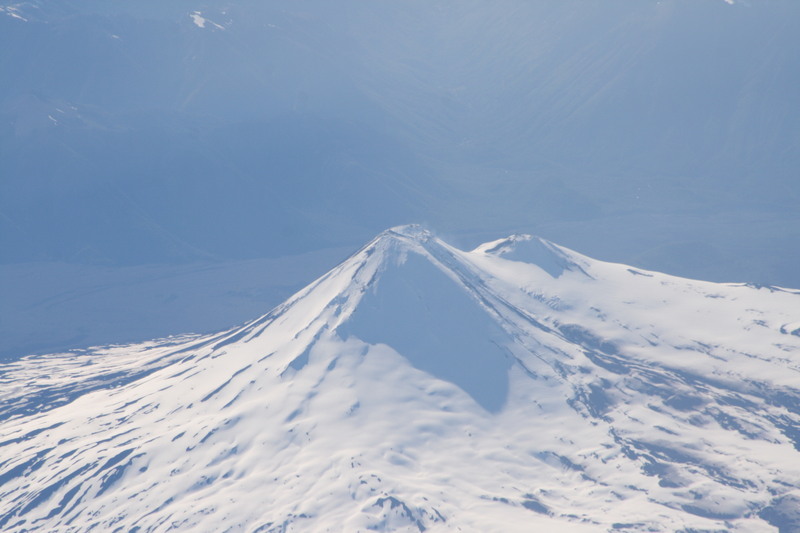 Osorno last erupted in 1869; Tromen is thought to have last erupted in 1822. Volcan Calbuco (41.3 S), which last erupted in 1972. Data source: information on the recent eruptions of these volcanoes is all from the Smithsonian Institution Global Volcanism Project. CR Stern, 2004, Active Andean volcanism: its geologic and tectonic setting. 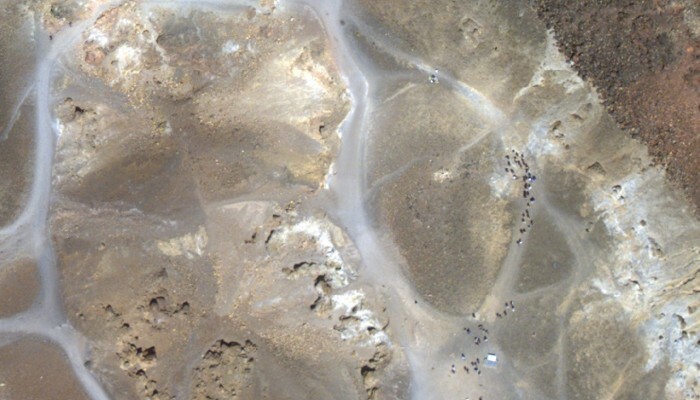 Revista geologica de Chile 31, 161-206 [Open Access]. SFL Watt et al., 2009, The influence of great earthquakes on volcanic eruption rate along the Chilean subduction zone. Earth and Planetary Science Letters, 277 (3-4), 399-407. SFL Watt et al., 2013,The volcanic response to deglaciation: evidence from glaciated arcs and a reassessment of global eruption records, Earth-Science Reviews 122, 77-102. Acknowledgements: my fieldwork in Chile over the past 10 years has been funded by NERC, IAVCEI and the British Council. Many thanks to my parents for introducing me to Chile and its volcanoes at the age of 7; and to Jose Antonio Naranjo and many others at SERNAGEOMIN for facilitating our continuing work in the region. August 27th marks the anniversary of the culmination of the great eruption of Krakatoa (or Krakatau) in Indonesia in 1883. This devastating eruption has become the archetype of a volcanic catastrophe, even though it was a geologically modest example of a ‘caldera forming’ event. The eruption of Krakatoa quickly made the headlines around the world, in part because newly installed undersea cables allowed the news of the event to be wired rapidly across the globe. Precursory eruption of Krakatoa in May 1883, several months before the climactic events of August 1883. From Symons (1888). The Krakatoa eruption was one of the first major eruptions to be intensively studied by scientists. The journal Nature published an editorial explaining the ‘Scientific Basis of the Java Catastrophe’ shortly after news of the eruption broke, and over the next few weeks published reports with the first descriptions and explanations of some of the many widespread effects of the eruption – from the appearance of great floating rafts of pumice, to the many oceanic, atmospheric and other phenomena that accompanied the event. In February 1884, the Royal Society set up the Krakatoa committee, chaired by a meteorologist George Symons, to collect information on ‘the various accounts of the volcanic eruption.. and its attendant phenomena’, including ‘authenticated facts respecting the fall of pumice and dust .. unusual disturbances of barometric pressure and sea level.. and exceptional effects of light and colour in the atmosphere‘. These results were published in 1888 in a wonderfully illustrated monograph, which still stands as one of the most complete accounts of a major volcanic eruption and its widespread effects. 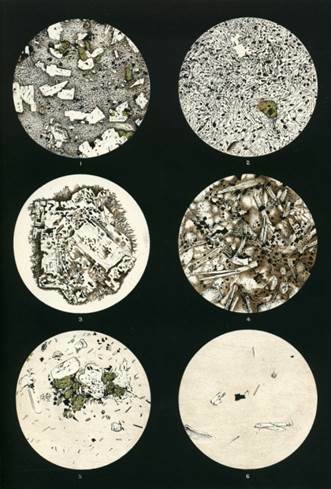 Drawings of microscope views of Krakatoa rock samples in thin section. This set of images are of lavas from Krakatoa, from Symons (1888). These are quite rich in crystals (white feldspar; green pyroxene), set in a fine matrix of glass (colourless to brown). Images on the left: about 1 cm across; on the right – about 1 mm across. 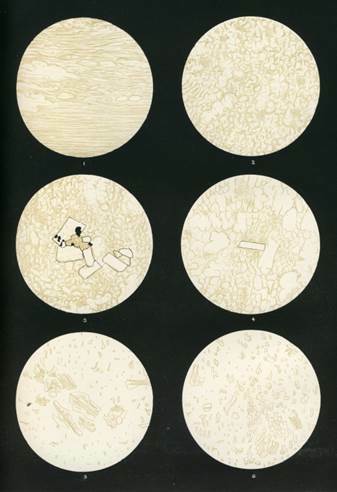 Drawings of microscopic images of 1883 Krakatoa pumice and ash samples . The pumice samples are mainly made of glass (very pale colour) with gas bubbles. The top 4 images are each about 1 cm across, and show the texture of lumps of pumice. The bottom two images are each about 1 mm across, and show the ‘ash’ that fell over a thousand miles away from Krakatoa on the ship Arabella (left), and the ‘ash’ formed by grinding up a sample of pumice. From Symons (1888). The most celebrated impact of the Krakatoa eruption in terms of science was the recognition that the many optical effects that followed the eruption, including both spectacular sunsets (an example from London, in November 1883, below) and the discovery of ‘Bishops’ Rings‘, must be the consequences of the global spread of volcanic pollutants, high in the atmosphere. We now know that the major constituents of this haze were tiny droplets of sulphate, forming a thin aerosol layer in the stratosphere which scattered and absorbed incoming solar radiation. 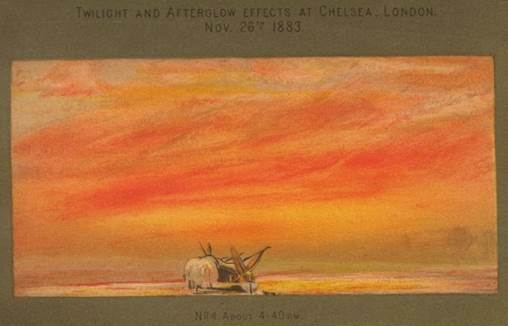 Sunset at Chelsea, 4.40 pm, November 26th, 1883. From Symons (1888). Although the Krakatoa eruption was one of the largest eruptions of the past 200 years, it is not exceptional in comparison to other eruptions from the geological record. In terms of eruption ‘size’ it rates as a ‘6’ on the Volcanic Explosivity Index, having erupted an estimated 12 cubic kilometres of magma. Eruptions of this sort of size occur once every 100 – 200 years around the globe; while the largest known explosive volcanic eruptions erupt many thousands of cubic kilometres of magma over a very short period of time. Krakatoa remains the best documented example of a ‘caldera-forming’ eruption, during which an entire volcanic edifice collapses. In this case, the eruption and the formation of the caldera had catastrophic consequences for tens of thousands of people along the shores of Java and Sumatra, as a series of major tsunamis triggered by these events swept ashore. G.J. 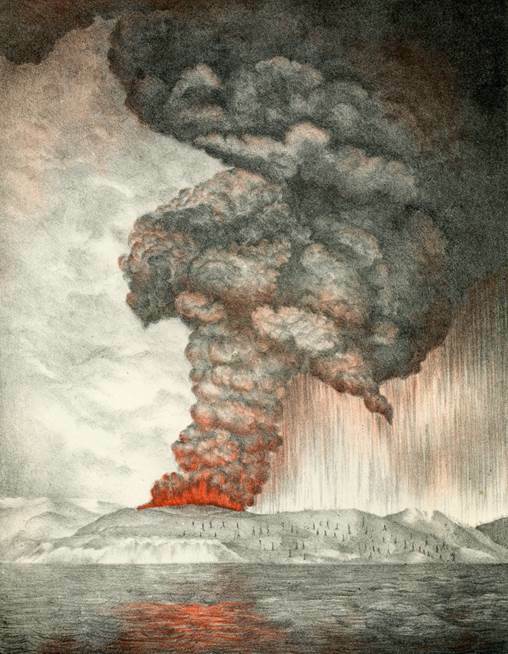 Symons (Editor, 1888), The eruption of Krakatoa and subsequent phenomena. Report of the Krakatoa Committee of the Royal Society. London : Trübner & Co.
Santorini: a volcano in remission? In January 2011, Santorini volcano in Greece began to show the first subtle signs of stirring after many decades of quiet – or at least many decades without detectable activity. This presented an exceptional opportunity to track the behaviour of a very well-studied volcano at the start of a phase of ‘unrest’. Although it may seem counter-intuitive, volcanologists don’t really have a terribly good idea of how volcanoes behave in the long intervals between eruption. 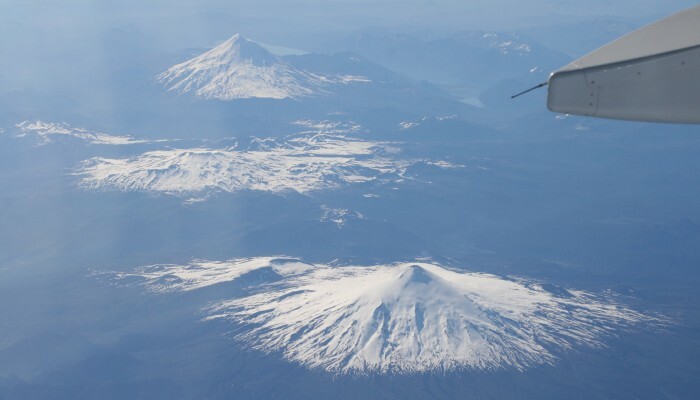 Most of the time, resources are devoted to studying volcanoes that are about to erupt, are already erupting, or that have recently erupted, rather than the slumbering volcanoes that might be thought to pose rather less of an immediate hazard. In the case of Santorini, the signs that the volcano might be awakening that we saw in early 2011 presented a scientific chance not to be missed. With urgency funding from NERC (although we did have to explain what the urgency was, without an eruption having happened) and support from our Greek collaborators, we were able to mobilise quickly and make the most of the opportunity to observe and measure while the episode of ‘unrest’ unfolded. Now, two and half years on, the stirring has subsided, and Santorini seems to be settling back into another period of quiet slumber. With the benefit of this hindsight, we can now take a look back over the ‘pulse’ of unrest, and begin to think about what this tells us about how the volcano works. At the beginning, in early 2011, the first signs of something stirring came from the tiny earthquakes that began to be detected beneath the centre of the volcano. Shortly afterwards, we were also able to see the signs of ground movement from both satellite and ground-based instruments, as the volcano began to swell. Measurements and modelling of this swelling both pointed strongly to the root cause of the unrest being the arrival of molten rock, or magma, about 4 kilometres beneath the volcano, at a point somewhere beneath the northern part of Santorini’s sea-filled caldera. 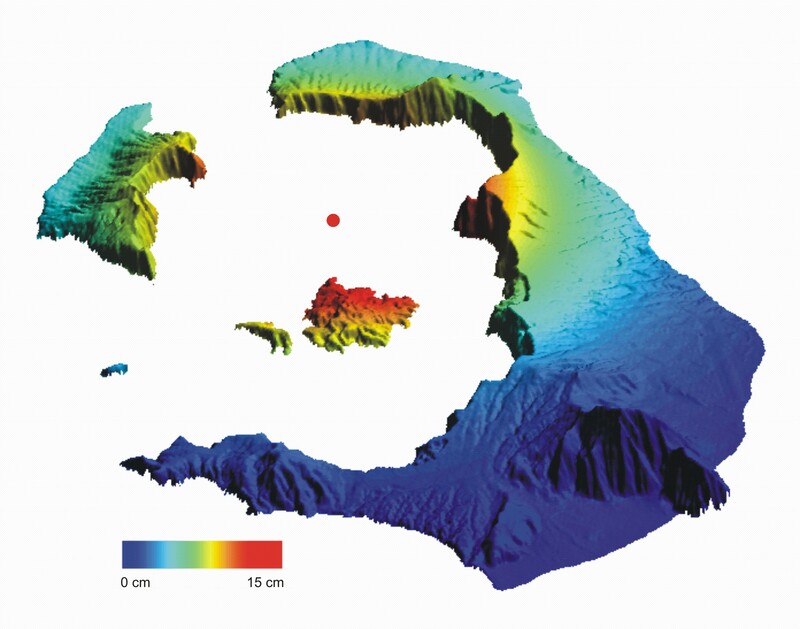 Vertical deformation of Santorini during the period of unrest in 2011 – 2012, determined by Michelle Parks (University of Oxford) from measurements of the deformation field across the islands. The deformation is best explained by the intrusion of magma about 4 km below the red dot. Over the course of the next 12 – 15 months (until about March – April 2012), ten to fifteen million cubic metres of molten rock slowly squeezed into this subterranean reservoir at depth, while we watched our instruments trace out the gradual changes at the surface. Over the same period we were also able to detect subtle changes in the gases leaking out of the summit craters of the Kameni islands; the young volcanic islands in the centre of the caldera. The Kameni islands are almost barren, formed from the overlapping fields of lava erupted over the course of a series of eruptions during the past 2000 years and more. You can get a sense of this from the aerial photographs captured by the NERC-funded aircraft that surveyed the islands in May 2012. Right in the centre of the younger of these islands, Nea Kameni, the tourist trails circle around the shallow craters formed during eruptions over the past century. Although there is very little visible evidence, apart from a couple of small steamy vents, this summit area is gradually leaking carbon dioxide and other volcanic gases to the atmosphere. The concentrations of these gases are too low to be measured remotely (from satellites, or automated spectrometers), and instead have to be measured directly during field campaigns. 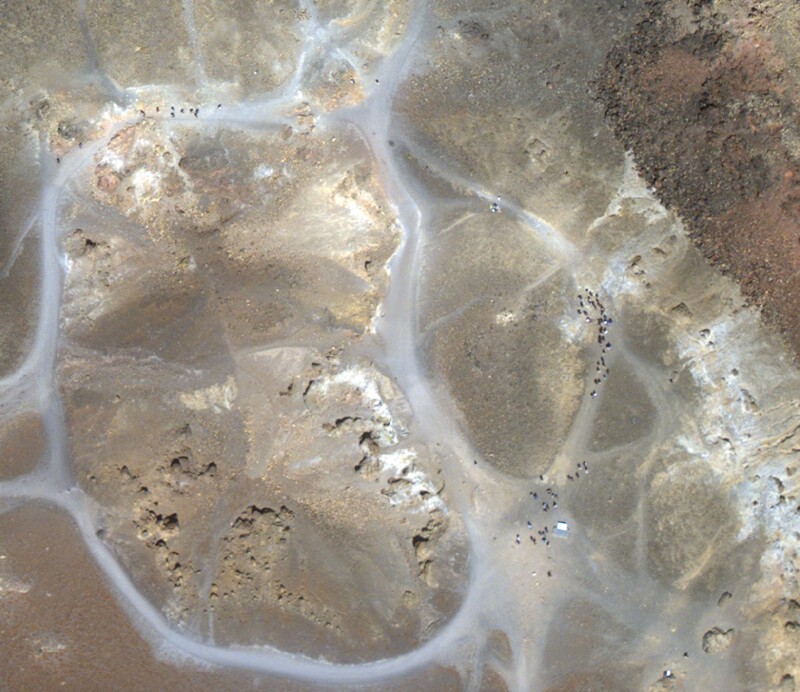 Aerial view of the summit area of Nea Kameni, Santorini, Greece, showing the tourist trails (in grey – look for the people) that run around the edges of the Agios Giorgios craters. 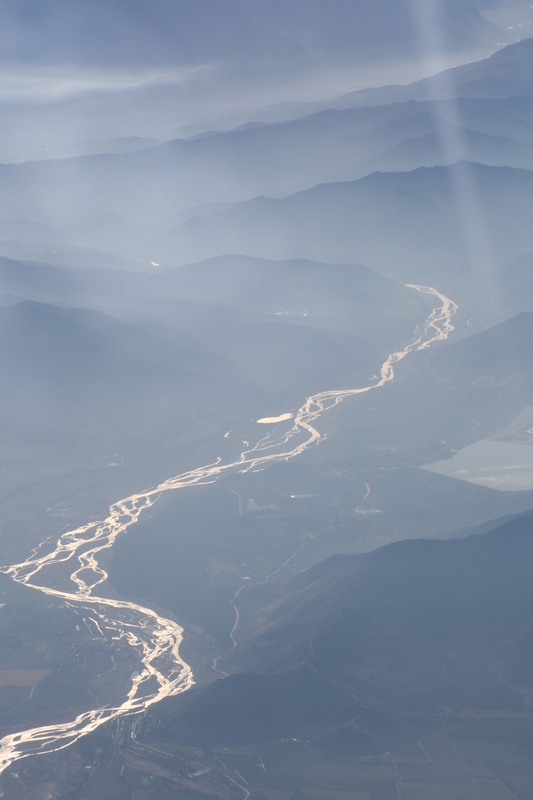 Photo taken by the NERC Airborne Research and Survey aircraft on flight EU12-12, May 2012. We were interested in measuring the carbon dioxide that is escaping out of the soil, as this is one of the gases that we expect to be released from magmas as they rise up through the Earth’s crust. Carbon dioxide is quite easy to measure, because it has a couple of strong absorption bands in the infra-red, and there are several tailor-made instruments available that can make these sorts of measurements routinely. Most ‘soil gas flux’ instruments are based on the ‘accumulation chamber’ method, a technique adapted for volcanic applications in the early 1990’s. This involves measuring the rate at which carbon dioxide seeps out of the soil into a small volume chamber, resting on the ground surface. 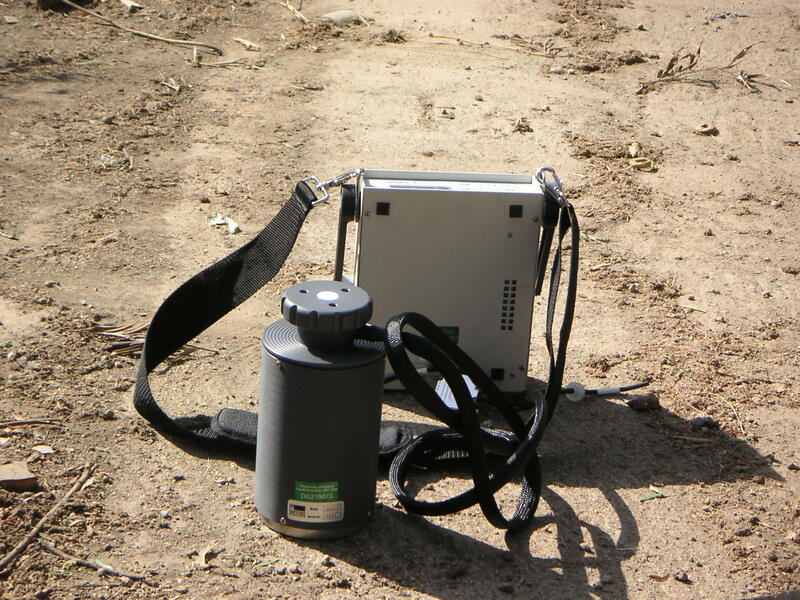 Soil gas measurement system using a PP systems accumulation chamber and portable gas analyser. The accumulation chamber sits on a collar, pressed into the soil. This picture is from a field setting on a volcano in Ethiopia. 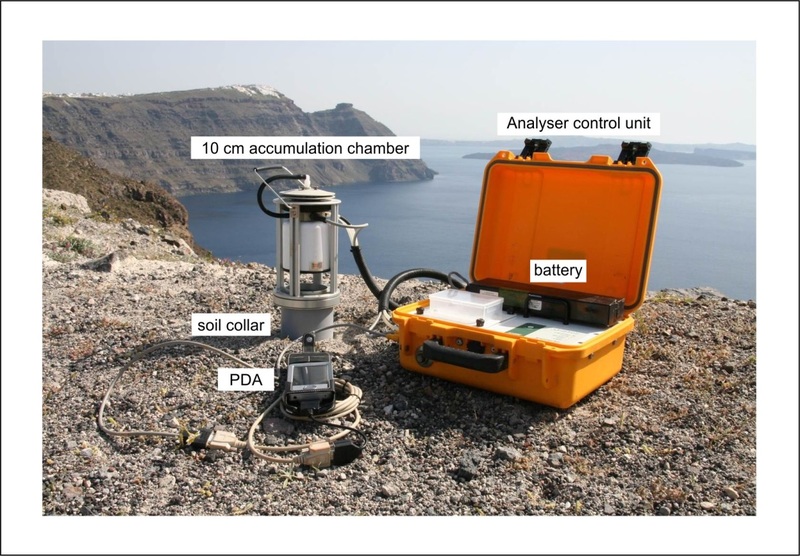 In the field set up that we adopted on Santorini, Michelle Parks was also able to collect small fractions of the soil gas for carbon isotope analysis in parallel with the measurements she was making of the soil gas flux itself. LiCOR soil gas accumulation system on Santorini, ready for deployment. Courtesy of Michelle Parks. As well as measuring carbon dioxide, we also measured concentrations of the short-lived radioactive gas, radon-222 in the soil gas. Radon is a naturally-occurring radionuclide, which decays by alpha-decay. Radon can be measured using ‘passive’ detectors made of a special plastic (manufactured by TASL), that records the tracks left by the alpha particles that are released from the radon atoms as they decay. After exposure to the soil gas environment for a few days, the plastic detectors are etched to reveal the tracks, ready for counting and calculation of the radon gas concentration. Together, these measurements of carbon dioxide emission rate; of carbon dioxide concentration; of carbon isotopic composition, and the radon concentration – allowed us to tease apart the different sources of carbon dioxide that come together to form the ‘soil gas’. In particular, we distinguish the carbon dioxide produced by bacteria in the soil, from that produced deeper inside the volcanic system; and we can also distinguish between carbon dioxide that has recently escaped from a degassing body of magma, and the carbon dioxide released by reactions between the hot, intruding magma and the limestone rock that forms a part of the ancient basement to the volcano. Our new measurements show that after the intrusion of magma began in early 2011, the pattern of soil-gas carbon dioxide changed, as new gas percolated into and through the shallow parts of the volcano towards the surface, before escaping. This gas pulse has now passed through the system, and all of the signs now suggest that the volcanic system beneath Santorini is returning to a quiet state. We will, though, all be keeping a watchful eye. Santorini volcano remains in remission, and the episode of unrest has passed. The story of the past 20 years of satellite-observation of the slow ups-and-downs of the volcano has now been documented in another recent paper by Michelle Parks (Parks et al., 2015). Selected further reading (technical): a selection of the papers that describe some of the features of unrest on Santorini since 2011.